When you're choosing a look for your fairy, unicorn, or angel costume, you have a lot of options. You can go with short pixie hair with jewel-toned locks. You could throw on sleek long hair with multi-colored strands that fall to your waist. But here's the thing, if you want a look that shows off your wild energy and bounce, this curly wig is where it's at! It's as soft as a bunny's tail. As like as spun cotton candy and maybe a little sweeter. If you want to look like you spend most of your time inspiring flowers to bloom and capturing moonbeams in dew drops, you'll want a bouncy look. Because you're magical and mystical, sure. But you also have a playful, energetic side thus the lovely bounce factor. 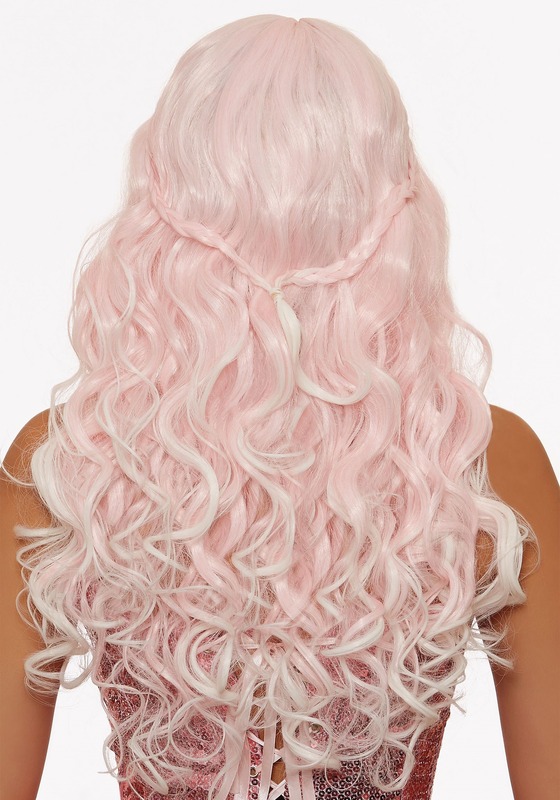 These lovely light pink locks fall long past the shoulders. The front has long bangs that can be arranged to your liking. A circle of braids will crown the top of your head. You can even tuck flowers and vines into the strands to add character to your look! If you're ready to have plenty of pink locks that tumble past your shoulder? Of course, you are! The real question? Will you be ready to go on without it? Luckily for you, you can wear this gorgeous wig again and again!